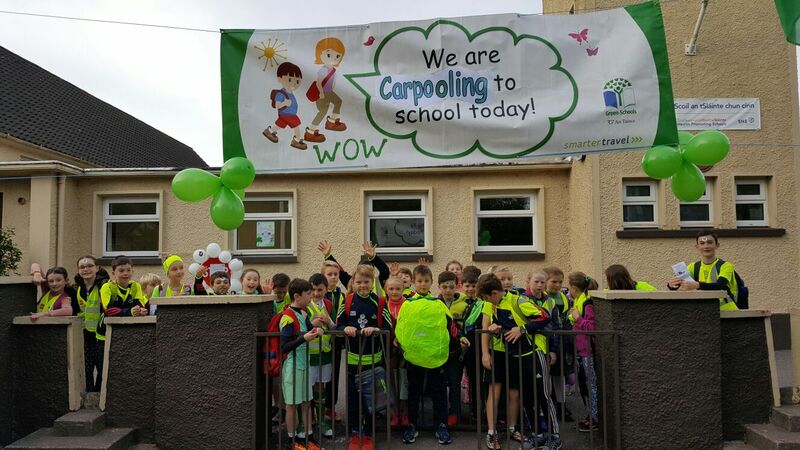 Scoil Bhailenora is a mixed, rural primary school in County Cork with over 200 pupils and has a catchment area of 10km. The committee was formed from a selection of students in each class. Willing volunteers put themselves forward and their classmates voted. 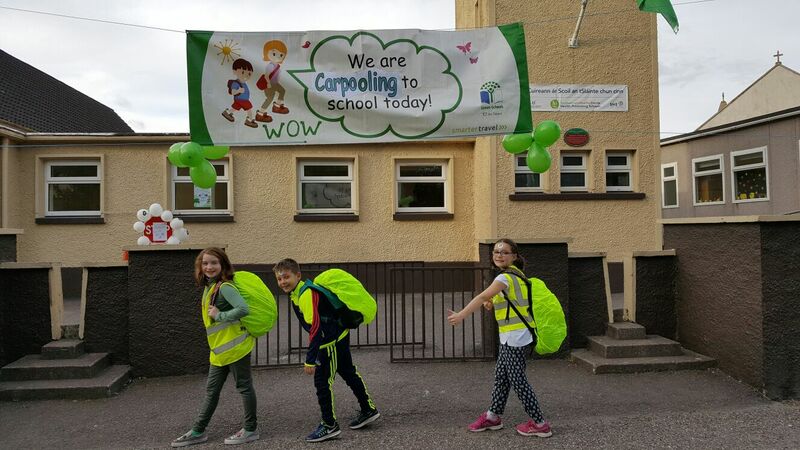 The committee changed each year and also includes Green-Schools coordinators, the Principal, caretaker and the school’s assigned Green-Schools Travel Officer. They hold regular meetings and invite all the members to take turns taking minutes. The meetings update everybody on what has been done and decide on future events. 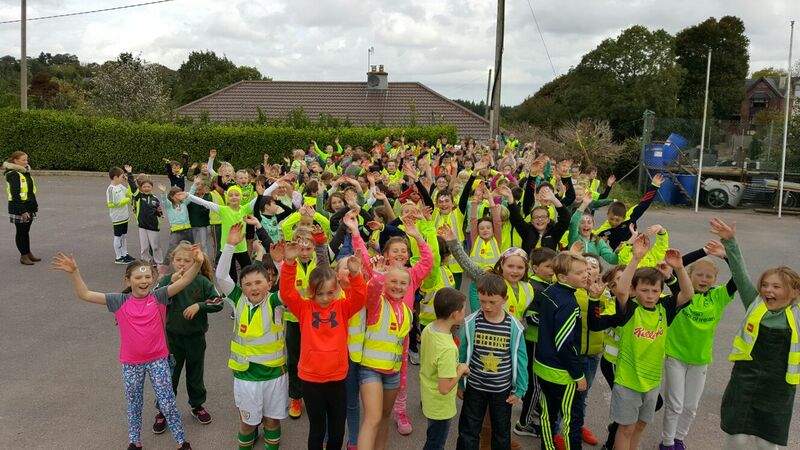 A walkability audit was completed in Year One to provide an idea of the situation in and around Ballinora School. 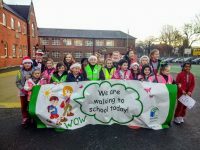 The Green Committee investigated how safe it was for students to walk or cycle to school. The school was not surprised to find there is no infrastructure to help people walk to school. The main access is via narrow, windy lanes with no pavements. The majority of students are driven to school. A baseline travel survey was also carried out by their Travel Officer. The results showed that the majority of students travel to school by car (87%). The following three surveys showed numbers of students travelling by car was consistent. The percentage of students walking ranged from four to eight per cent. 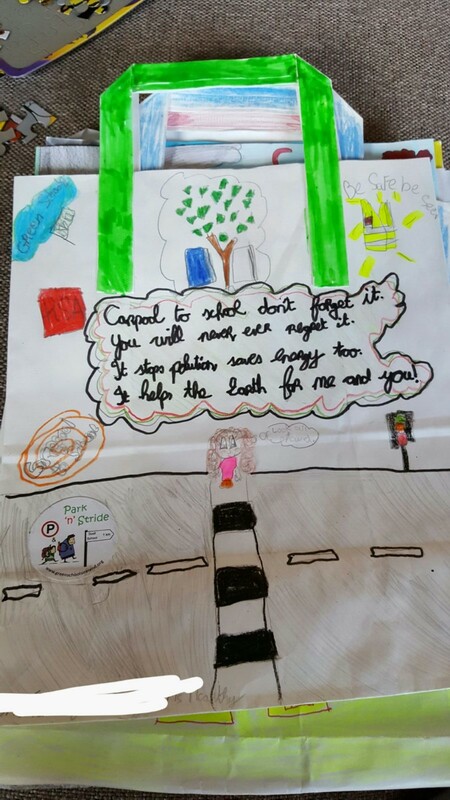 The committee made a number of recommendations to increase safety at the school gate including repainting double yellow lines to prevent cars parking on both sides of the road and creating a gap in the hedge opposite to prevent children crossing the road at an angle. It was also recommended that the speed limit outside school be lowered to 30kph in accordance with the Love 30 campaign. 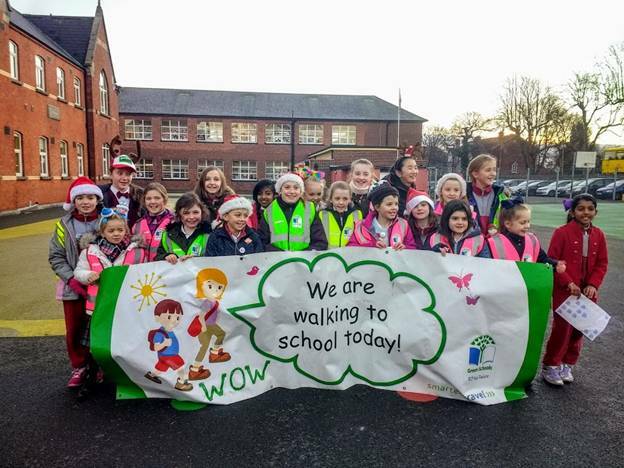 The walkability audit was sent on to the area road engineer to let them know the situation around the school and see if any improvements could be made. Promote road safety and awareness to make a safe environment for walking/cycling and carpooling. The committee considered the environmental review and realised that there is no safe option for most students to walk or cycle to school. 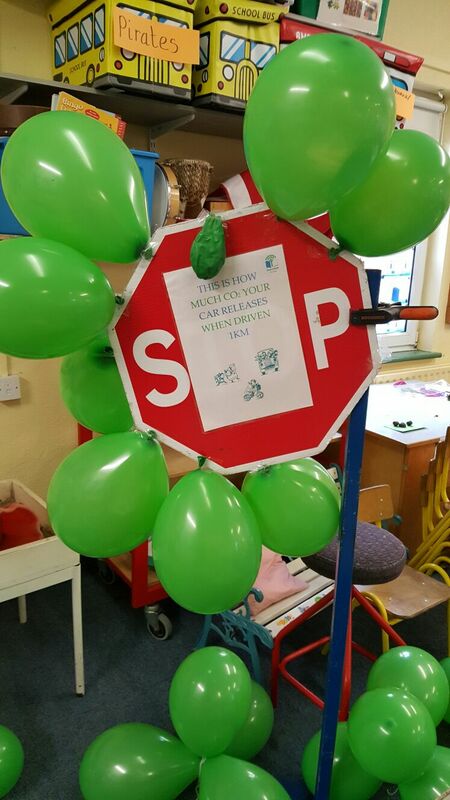 In Year One an entire week was devoted to road safety awareness. 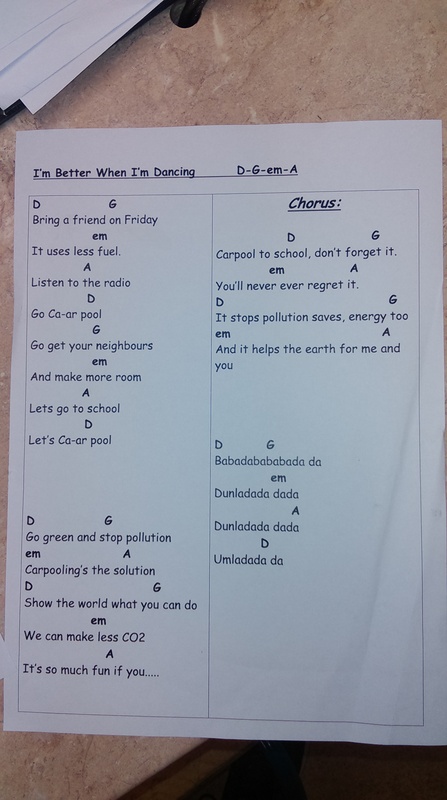 They decided to concentrate on carpooling as a way of reducing cars at the school gates. 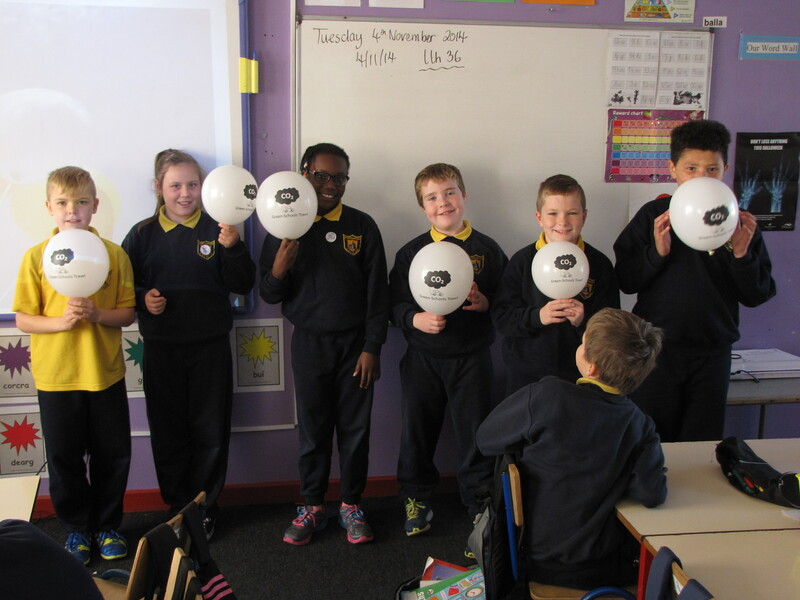 ‘Bring a Friend on Friday’ was launched with lots of excitement, classroom competitions and prizes. Each class recorded how everybody was travelling and there were weekly prizes for the ‘Golden Boot’. 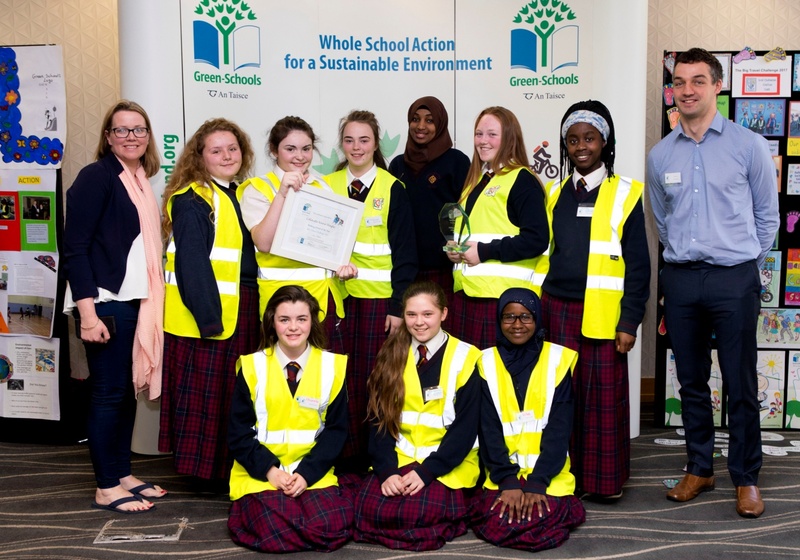 Other initiatives on the committee’s Action Plan included cycle training from Cycle Sense which was partly funded by Green-Schools. 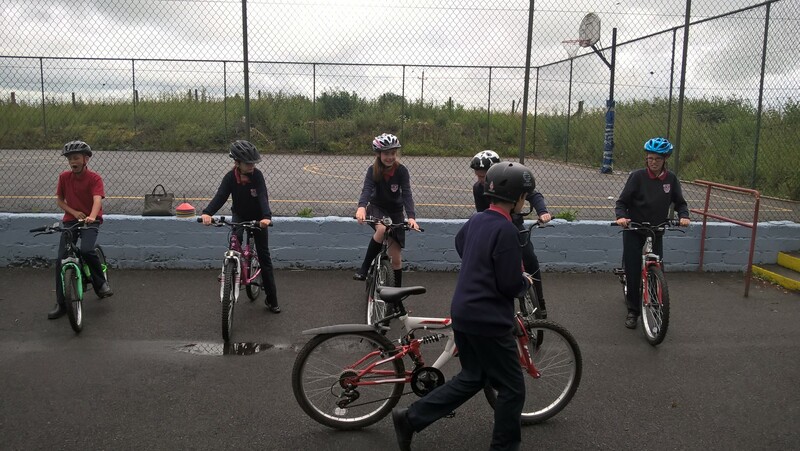 Students from fourth class had weekly lessons in cycle skills and safety. The committee organised many different events and all of this was recorded on the notice board, website and Twitter. Information is given out at parents meetings and announced over the intercom throughout the day. Each classroom recorded on a tally chart how pupils travelled each day and submitted their numbers weekly. These were published on the notice board and at the end of a six week period there was prizes given to the greenest classrooms which included: no homework; an ice cream party and uniform-free day. The initial Bring a Friend on Friday was very successful and the committee decided to launch ‘BFF’ as a permanent event with prizes for the classes travelling most sustainably. The baseline survey recorded 17.3% carpooled and the final Follow On survey recorded a fantastic 38.6% carpooling showing over a 50% increase in carpoolers. There is now an average of 30 fewer cars at the school gates daily and the benefits are being felt. It is less congested resulting in a safer environment for everybody. The highest result during the school’s involvement in the Big Travel Challenge recorded 118 pupils carpooling. 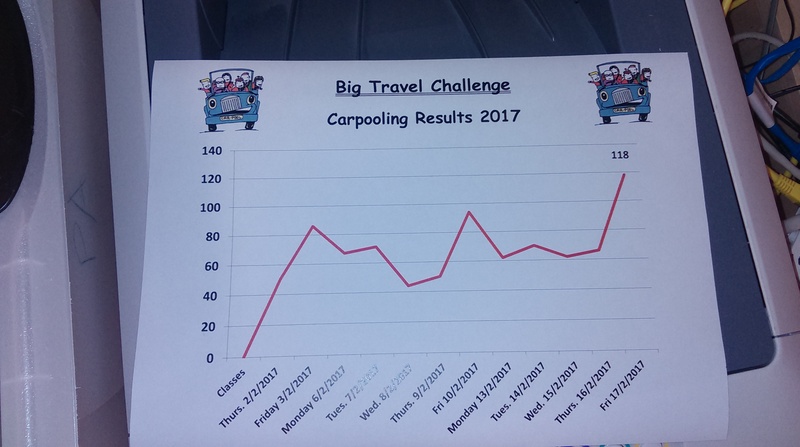 The school decided to enter the Big Travel Challenge 2017 and won the best school nationwide in the carpooling category! A selection of the committee travelled up to Dublin on the train and collected their prize. They also received a cheque for €500 for the school. PE: Cycling, games and walking. 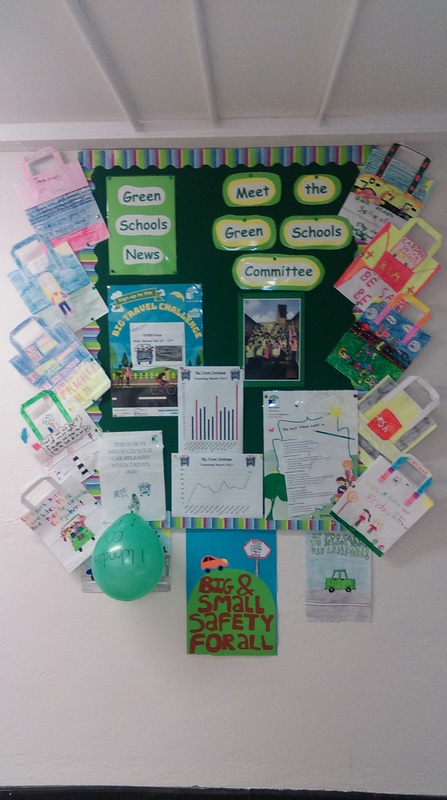 The notice-board is in a prominent spot in the corridor with all the Green-Schools information kept up to date. There is a top tips section to ensure all the other themes are being maintained. A monitor is in reception with Green-Schools info on a loop and all teachers have the Green Code as a screensaver. It helps the earth for me and you!